One of my favorite things to do (besides gardening) is visiting botanical gardens and arboretums in our travels. Not only do I find it a relaxing endeavor ripe with great photo opportunities, it’s a wonderful way to gather ideas for your own garden. I finally made it to the beautiful Anderson Japanese Gardens in Rockford last summer and I cannot wait to get back there! Such a tranquil and inspirational place to walk around, meditate, and get away from the stress of the outside world. 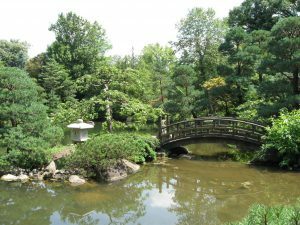 The gardens are named after its founder, Rockford businessman John Anderson, who was inspired by a visit to the Portland Japanese Garden in Oregon. 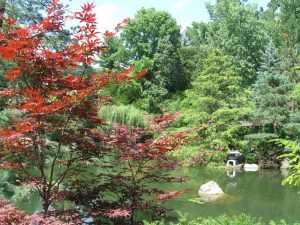 With the assistance of renowned Master Craftsman and designer Hoichi Kurisu, the land was transformed into a Japanese-style landscape in the late ’70’s. 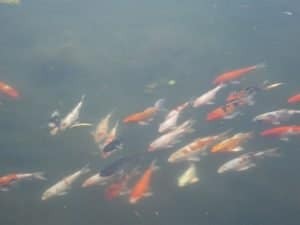 On my next visit, I will stop in the gift shop and pick up some koi food to feed the myriad of colorful koi fish in the garden ponds. They greet you with open mouths hoping for a few morsels of their favorite kibble.